Thirsty Pilgrim: One Hundred Casks of Future Joy. One Hundred Casks of Future Joy. 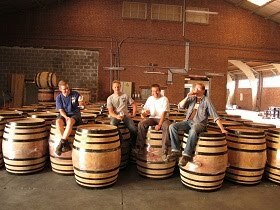 Here we see a crack squad of elite brewers, also including Jean Van Roy from Cantillon and Bernard Leboucq from Senne, pretending like they are not extremely busy after the arrival of 100 wine casks from Burgundy and Côte du Rhone. Eighty of them are destined for Cantillon lambic. The other 20 are for Yvan and Bernard's lambic-ale blends and other experiments in mixed fermentation. All will be kept for now in the Senne brewhouse in Molenbeek, where this photo was taken. 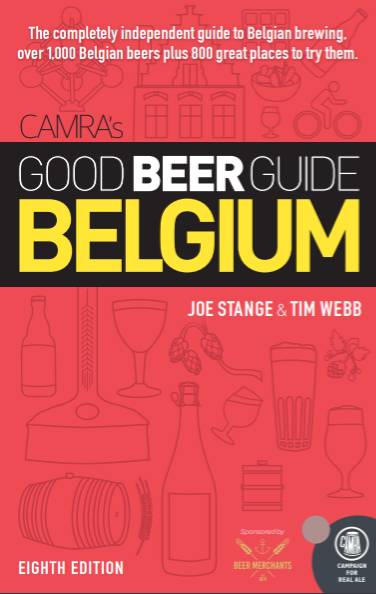 Past Senne blends, frustratingly rare, have included Crianza and Saison de la Senne. Bottles of Crianza are virtually impossible to find these days. If you know someone with a bottle in their cellar, be very friendly to them. Meanwhile you're slightly more likely to find the more recent Saison--especially if you walk into Moeder Lambic with a budget for that sort of thing. However they will theoretically be less rare within the next year or two. That's because the Brasserie de la Senne is, finally, just about ready to open. True. Yvan tells me they are on target to start brewing in late September. Which means October is far more likely. From left to right: Dominique Thelen and Jean Van Roy of Cantillon, and Bernard Leboucq and Yvan De Baets of Brasserie de la Senne. And lots of barrels. Pardon the exclamation point but "Woo hoo!" Yep, that pretty much sums up my feelings on the matter. Blending anything, especially involving oak, is something I love and wish more brewers would do. Cheers. A Very Good Beer Guide to... Latvia. There Is Craft Beer in Costa Rica Again. Invite a New Kid to Sit at Your Lunch Table.